President Donald Trump said Friday he may pardon the late heavyweight boxing champion Muhammad Ali, who doesn't seem to need one since the U.S. Supreme Court already overturned his conviction more than four decades ago. And for futures acts of clemency, Trump may seek recommendations from pro football players and other athletes who have protested racial injustice by kneeling during the national anthem, he said Friday. Trump said that "instead of talk," he is going to ask protesting players to suggest "people that they think were unfairly treated by the justice system." 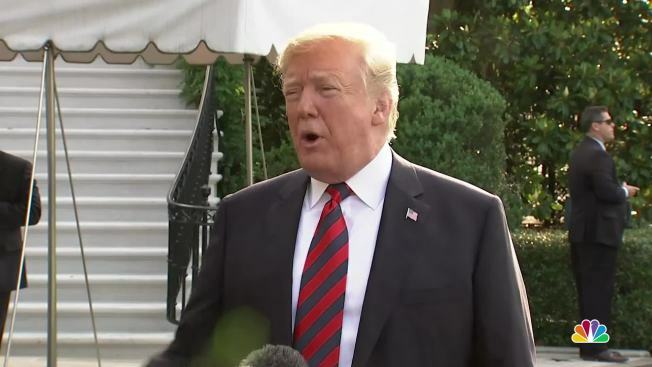 The president said football players have "seen a lot of abuse" and "a lot of unfairness" and that he wants their input on his use of this executive power. Trump told reporters as he left the White House for a meeting with in Canada with U.S. allies that his team was "looking at literally thousands of names" of people for potential pardons because they were treated unfairly or their sentences are too long. Ali is one name on this list, Trump said, though it was not immediately clear why Ali would need a pardon because he has no criminal record. The Supreme Court overturned his conviction for resisting the draft. Former President Jimmy Carter later issued a pardon on his first day in office affecting hundreds of thousands of Vietnam-era draft dodgers, including those who hadn't been convicted. Samuel Morrison, a former Justice Department attorney in the Pardon Office, told NBC News that a pardon could still function as "an act of forgiveness." "The pardon is for the conduct, regardless of whether there was or still is a conviction," he said. Trump already has granted a posthumous pardon to boxing's first black heavyweight champion, Jack Johnson, more than 100 years after many saw as his racially charged conviction. Johnson was convicted in 1913 by an all-white jury of violating the Mann Act for traveling with his white girlfriend. That law made it illegal to transport women across state lines for "immoral" purposes.